OBceans react to unanimous City Council vote to approve the OB Community Plan, Nov. 9, 2015. Several people said to me: “It was all over too soon.” They almost couldn’t believe it. But yes, it was over – the Ocean Beach Community Plan – freshly updated – was finally approved by the San Diego City Council in an unanimous vote Monday afternoon – the ninth of November, 2015. It was in a way, anti-climatic. The real drama had already been played out last year and this summer. After hearing a final city staff presentation by planner Karen Busey and then a speech representing OB by current chair of the OB Planning Board John Ambert, Councilwoman Lorie Zapf made a motion to approve, and Todd Gloria seconded it – and the board lit up: every councilperson voted for it. Councilwoman Lorie Zapf addressed the audience just before making a motion to approve the Plan. 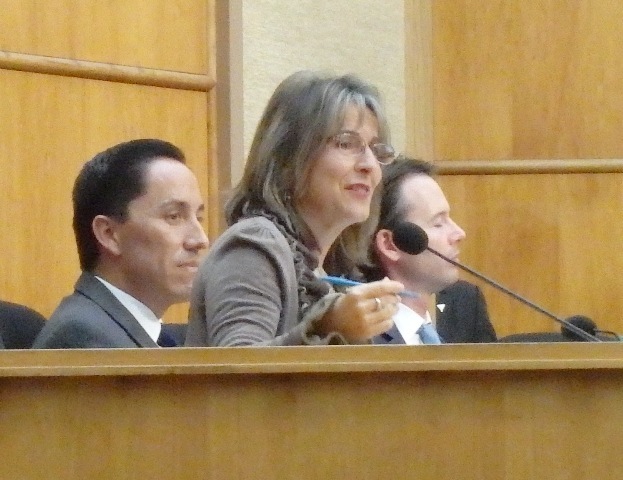 Todd Gloria, who seconded it, is on the right (in the photo). Several dozen blue-shirted OBceans stood up and clapped and cheered. As everyone filed out into the 12th floor lobby, Zapf joined them for photos – now having donned the iconic blue T-shirt emblazoned with “Keep the OBcean attitude”. The formal update process – initiated by city staff over a dozen years ago – had culminated on the Ocean Beach community level with the approval of the draft by the OB Planning Board in spring of 2014. It then went on to a council committee meeting but was almost derailed by the San Diego Planning Commission in late May. 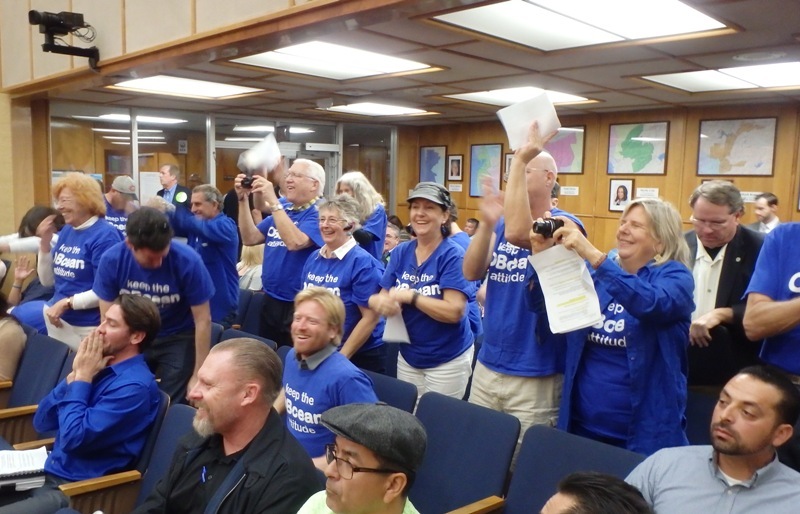 After the community mobilized – signified by the 3500 petition signatures and a “sea of blue” at the final Council show down on July 29, 2014 – the plan update was tentatively approved by the City Council in an unanimous vote. By time it reached the California Coastal Commission exactly a year later, another showdown ensued at the Commission’s hearing on August 13, 2015. Due to a strong showing of OBceans at that hearing, Coastal staff and city staff were inspired to craft historic compromises – with a final unanimous vote by the full Commission. Then the San Diego Council had to formally approve the modifications that were the result of the compromises and Commission vote. The Plan has one more formal stop – the consent calendar of the Coastal Commission – sometime in early 2016 – where the Commission will make a final stamp as a routine formality only. It’s been a long process – and now the OB Planning Board has an up-to-date Community Plan to exercise. There’s a camera in the top left corner of the photo. Is that Big Brother watching Big Brother? It’s closed circuit for the overflow room. The Loop: council chambers, overflow room, NSA . Mindy Pellissier, who guided and directed everyone through the process. A huge thank you to everyone working on this for so many years!! !